When Apple released their latest version of iTunes 8, they introduced an interesting new feature called “Genius”. Sure, it’s on par with Apple’s pretentiousness to call their features smarter than you – but I have to admit, it makes a great play list. The genius will build a play list based on the song you selected. 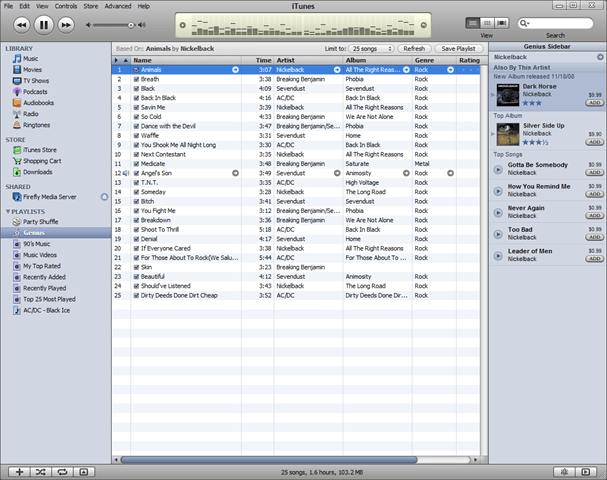 It uses a database of your existing music, play habits, and the habits of other users that are using iTunes genius. It’s a bit of a black box, but it’s confirmed that iTunes sends some of your info up to the mother ship for processing, and can take quite a long time if you have a large library of music. Anyway, when this was all released – AC/DC and The Beatles were not part of the database. It was obvious that they were left out of the initial genius build. Apple must be allowing other users’ preferences for music to be included now because in the last few days the genius lists that I generate are now including AC/DC and Beatles music.